Residential dishwashing machines and their possible effects on septic systems are explained in this article. Will the discharge from a home dishwashing machine into a private septic system harm the septic tank or drainfields? What detergents are best to use in a home dishwasher to minimize impact on the septic system and the environment. How can we reduce the impact of a dishwasher on a septic system - should we install a separate drywell? This document explains how to extend the life of the septic system by being careful about what goes into it. Does a dishwasher water volume overload and harm the septic system? The volume of water from home dishwashing machine use should not be a problem with a normal septic system in good working order. Does dishwasher detergent or dish soap harm the septic tank or septic system drainfield? The volume of dishwasher detergent or dish soap used in sinks entering the septic system is so low as to be very dilute when it enters the septic tank, dilute enough that it is not going to harm the septic tank bacteria at normal levels of residential dishwasher use. However many if not most dishwasher detergents contain phosphates or nonylphenol ethoxylate surfactants. Surfactants are what make detergents effective in lifting soil particles off of a surface (a dish in the dishwasher or a shirt in the washing machine). Dishwasher detergents do not make a high level of suds inside the dishwashing machine. If you've ever made the mistake of putting normal dish soap into a dishwasher (as did this author) you know what a disaster will ensue - with sudsy soap overflowing out of the dishwasher and across the floor. Dishwashers rely on surfactants, high water temperature, and time spent spraying across the dishwasher contents to clean them. Even if they don't kill off your septic tank or drainfield bacteria, surfactants and phosphates that run through a dishwasher ultimately enter ground water and surface water may also become contaminated. Surfactants in dishwasher detergents (and from any source) are toxic to fish, basically suffocating them by interfering with the ability of the fish's gills to absorb oxygen from water. Phosphates in dishwasher detergents pass through the septic system (or municipal wastewater treatment system) and enter surface water causing very high growth rates of algae. The algae growth, in turn, suffocates fish and other life in rivers, streams, lakes, and ponds. The rapidly growing "dead zones" at the edges of major water bodies around coastal areas of the U.S. and other countries are blamed on surface runoff that contains phosphates, (probably largely from agricultural use). According to Cliff Davies, a U.S. EPA engineer reported in the New York Times The level of phosphates in dishwasher detergent has been significantly reduced since the 1970's. But Mr. Davies was unable to identify specific dishwasher detergent products or brands that were high in surfactants or phosphates, and the Times article reported that the U.S. EPA "Design for the Environment Program" which he administers does not track products that are problematic. The EPA does, however, list dishwasher detergent products whose manufacturers report to the EPA that they use the safest chemicals. The EPA does not perform tests to confirm the accuracy of product claims. In sum, consumers who want to minimize their contribution to environmental pollutants by their choice of dishwasher or washing machine cleaning products may want to purchase products listed by the EPA's "Design for the Environment Program" but the listing designation does not appear to be supported by independent testing nor publicly available data. As of June 2013 it's the best we'd got. Reader Question: what dishwasher detergent should I use if I'm collecting graywater to irrigate plants or a garden? How do I match "unwanted chemicals" to detergent products' list of ingredients? I have been thinking a lot about the grey water plans we have going. Our method will be very simple: all the wash water will go to a drum that is fitted with a hose. We plan to move to the hose to tree basins as needed. The attached is a reference I came across. It really doesn't help me very much in a specific way. For example... how do the ingredients in Dawn dish washing soap match up to the chemicals on the chart? Or, how do I select the least offensive laundry soap? The citations sections of this and other articles we cite here list some excellent references on graywater including some building codes that can be taken as a design minimum if you want the water discharged from the system to be long term usable on plants or a garden. At least in the U.S. where in 2010 seventeen states adopted laws that required a big reduction in the level of phosphates in detergents, most laundry and dish detergents you may buy at even standard outlets are likely to be low in phosphorous. Also using liquid detergents and soaps in the sink, laundry, dishwasher, or soap packets or tablets in the dishwasher may avoid additional plumbing system clogging (and soil clogging where connected to a private septic like yours) that occurs from excessive use of powdered products. Seventh Generation Free& Clear, Method 3x Concentrate, Arm & Hammer, Era, Oxydol laundry detergents. - are recommended by Jet Inc., owners manual for BAT MEDIA SEPTIC PLANTS; also see Alhajjar 1989 at REFERENCES. If we look for "green" laundry detergents, dish soaps, and dishwasher soaps, unfortunately that does not mean you'll find these products at your local bodega. Watch out: you probably already know this, but don't use a sudsing detergent like dish soap in a dishwasher nor washing machine - you'll have a suds disaster. Look for information on the ingredient label that discusses the level of phosphorous, phosphates, and surfactants. Some readers who wish to avoid perfumes and dyes (generally not harmful to the septic tank or drainfield) may find those chemicals hard to recognize except by the smell test. One option is to install a separate graywater system (greywater) or drywell to receive water from the dishwasher. If you are considering this step, consider connecting both dishwasher and clothes washer to a common drywell. At some properties with very limited septic capacity, a large drywell may be installed to handle additional gray water from other building fixtures such as sinks and showers. See DRYWELL DESIGN & USES for additional information. Citation of this article by reference to this website and brief quotation for the sole purpose of review are permitted. Use of this information at other websites, in books or pamphlets for sale is reserved to the author. Technical review by industry experts has been performed and comments from readers are welcomed. Contributors are listed at the end of each article. This article is a section of our online book SEPTIC INSPECTION & TEST GUIDE whose chapters are shown at the end of this article. Citation of this article by reference to this website and brief quotation for the sole purpose of review are permitted. Use of this information at other websites, in books or pamphlets for sale is reserved to the author. Technical review by industry experts has been performed and comments from readers are welcomed. Contributors are listed at the end of each article. Continue reading at DRUGS INTO the SEPTIC TANK? or select a topic from closely-related articles below, or see our complete INDEX to RELATED ARTICLES below. 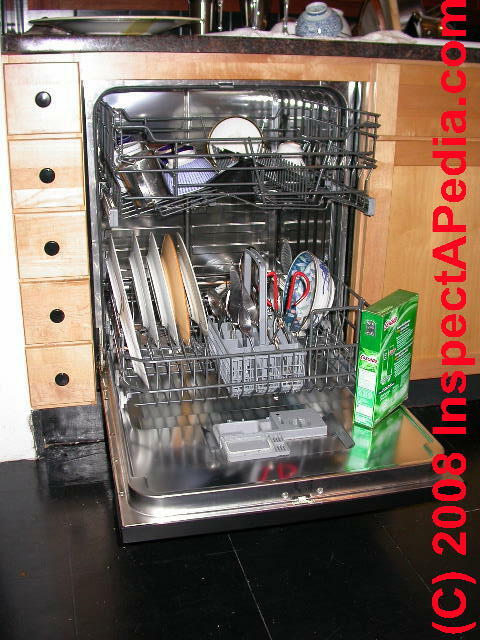 DISHWASHERS vs SEPTICS at InspectApedia.com - online encyclopedia of building & environmental inspection, testing, diagnosis, repair, & problem prevention advice. Question: any dishwashing detergent that keeps the septic un-plugged? We do not recommend specific detergent brands, but if you are using a liquid detergent that is already a step towards avoiding a clog in piping that sometimes occurs when powdered detergents are used in dishwashers or washing machines. And please take a look at our discussion above about surfactants and phosphates in the dishwasher detergent discussion in the article above. Question: ok to dispose of pet turtle tank water into the septic tank? I have turtles, is it ok to pour their tank water into a toilet that has a septic tank? But watch out that the turtles don't get poured down the toilet at the same time. They'd not enjoy that trip. There are diseases that occur "at the interface of human, domestic animal,and wildlife interactions" (Wildlife Epidemiology Lab 2015) and experts such as the folks I just cited note Salmonella, a pathogen associated with pet (and perhaps wild) turtles can be serious, though most Salmonella poisoning comes from ingesting contaminated food not petting turtles. However the same actions that occur on other pathogens in the septic tank and in drainfield soils should be effective in handling Salmonella that may be in your turtle wastewater unless you live by the ocean or a lake (Paul et als. 1995). Paul, John H., Joan B. Rose, Jordan Brown, Eugene A. Shinn, Steven Miller, and Samuel R. Farrah. "Viral tracer studies indicate contamination of marine waters by sewage disposal practices in key largo, Florida." Applied and Environmental Microbiology 61, no. 6 (1995): 2230-2234. Domestic wastewater disposal practices in the Florida Keys are primarily limited to on-site disposal systems such as septic tanks, injection wells, and illegal cesspits. Poorly treated sewage is thus released into the highly porous subsurface Key Largo limestone matrix. To investigate the fate and transport of sewage in the subsurface environment and the potential for contamination of marine surface waters, we employed bacteriophages as tracers in a domestic septic system and a simulated injection well in Key Largo, Florida. Transport of bacteriophage (Phi)HSIC-1 from the septic tank to adjacent surface canal waters and outstanding marine waters occurred in as little as 11 and 23 h, respectively. Transport of the Salmonella phage PRD1 from the simulated injection well to a canal adjacent to the injection site occurred in 11.2 h. Estimated rates of migration of viral tracers ranged from 0.57 to 24.2 m/h, over 500-fold greater than flow rates measured previously by subsurface flow meters in similar environments. These results suggest that current on-site disposal practices can lead to contamination of the subsurface and surface marine waters in the Keys. Yates, Marylynn V. "Septic Tank Density and Ground‐Water Contamination." Groundwater 23, no. 5 (1985): 586-591. CHIODINI, RODRICK J., and JOHN P. SUNDBERG. "Salmonellosis in reptiles: a review." American Journal of Epidemiology 113, no. 5 (1981): 494-499. Manire, Charles A., Howard L. Rhinehart, Deanna A. Sutton, Elizabeth H. Thompson, Michael G. Rinaldi, John D. Buck, and Elliott Jacobson. "Disseminated mycotic infection caused by Colletotrichum acutatum in a Kemp's ridley sea turtle (Lepidochelys kempi)." Journal of clinical microbiology 40, no. 11 (2002): 4273-4280. Mermin, Jonathan, Lori Hutwagner, Duc Vugia, Sue Shallow, Pamela Daily, Jeffrey Bender, Jane Koehler, Ruthanne Marcus, and Frederick J. Angulo. "Reptiles, amphibians, and human Salmonella infection: a population-based, case-control study." Clinical Infectious Diseases 38, no. Supplement 3 (2004): S253-S261. Woodward, David L., Rasik Khakhria, and Wendy M. Johnson. "Human salmonellosis associated with exotic pets." Journal of Clinical Microbiology 35, no. 11 (1997): 2786-2790. Can you use Rinse Aid liquid with a sewage treatment plant? As long as you are using this or any house hold washing material such as laundry soap or dishwasher detergent or a dishwasher spot preventer at the manufacturer's recommended levels the concentration of those substances in the septic tank should be so low as to be harmless. Is there a particular brand of dishwasher appliance that works best in a home on a septic tank system and handle a 5 person household? In general, dishwashers clean dishes with less water that will be used by people who wash dishes in the sink while leaving the water running. So as a water-saving appliance a dishwasher also reduces the water load on the septic drainfield. The dishwasher is not affecting the septic tank itself as long as you are using normal quantities of dishwasher detergent. IF choosing between two otherwise equal dishwashers, if you choose one that uses less water that further helps your drainfield. The same point applies to choosing a clothes washing machine. Subcommittee, Orsanco Detergent. "Components of household synthetic detergents in water and sewage." J. Amer. Water Works Assoc 5 (1963): 369-371. Szymanski, Nathan, and Robert A. Patterson. "Effective microorganisms (EM) and wastewater systems." Future Directions For On-Site Systems: Best Management Practice Proceedings of On-Site 3 (2003): 347-354. Zoller, Uri. "Groundwater Contamination by Detergents and Polycyclic Aromatic Hydrocarbons–A Global Problem of Organic Contaminants: Is the Solution Locally Specific?." Water science and technology 27, no. 7-8 (1993): 187-194.